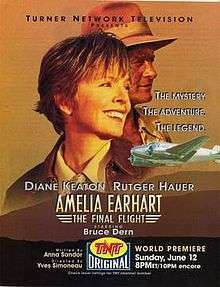 Amelia Earhart: The Final Flight (also known as Amelia Earhart) is a 1994 television film starring Diane Keaton, Rutger Hauer and Bruce Dern. It is based on Doris L. Rich's Amelia Earhart: A Biography. The film depicts events in the life of Amelia Earhart, focusing on her final flight and disappearance in 1937, with her exploits in aviation and her marriage to publisher G.P. Putnam being revealed in flashbacks. This film was not the first television dramatization of Earhart's life, as Amelia Earhart appeared in 1976, starring Susan Clark as Earhart and John Forsythe as her husband George Putnam. In 1928, Amelia Earhart (Diane Keaton) gains fame by undertaking a transatlantic flight, albeit as a passenger. Her marriage to media tycoon George Palmer Putnam (Bruce Dern) and a series of record-breaking flights propel her to international fame as a long-distance flyer. With help from a close friend and adviser, Paul Mantz (Paul Guilfoyle), Earhart and her navigator, the hard-drinking Fred Noonan (Rutger Hauer), plan her longest flight ever: a round-the-world attempt in 1937. The interest in Japanese-held islands may lead to her disappearance, and a massive search effort is unsuccessful, but solidifies Earhart as an aviation icon. Critics decried the inaccurate portrayals of historical figures such as Earhart and Putnam. Principal photography began on October 18, 1993 with studio work as well as location shooting in both California and Quebec. Although a Beech D18 was used, it was an adequate substitute for Earhart's famed Lockheed Model 10 Electra used in the circumnavigational flight of the globe in 1937. Well-known race pilot Steve Hinton, president of the Planes of Fame Air Museum and owner of Fighter Rebuilders, flew for the film. Interest in the story of Amelia Earhart, especially with the release of Amelia in 2009, led film reviewers to recall the earlier Earhart portrayals. Rosalind Russell had played "an Earhart-esque flier in 1943's Flight for Freedom" and Susan Clark starred in the 1976 miniseries, Amelia Earhart. Following closely the contemporary Earhart biographies that had appeared, Amelia Earhart: The Final Flight dramatized Earhart's final flight to the extent that more myth than fact comes through. Reviews of the performances in Amelia Earhart: The Final Flight were mixed, with some observers noting that the depictions were not true to the character of the historical figures that were portrayed. Keaton's understated portrayal of Earhart resulted in nominations for a 1995 Golden Globe and a 1995 Emmy for Lead Actress in a Miniseries or Special, as well as a 1995 Screen Actors Guild Award nomination. Editor Michael D. Ornstein won the 1995 CableACE Award for Editing while the production also garnered nominations for an American Society of Cinematographers, (ASC) Award for Outstanding Achievement in Cinematography in Movies of the Week/Pilots and an Emmy nomination for Single Camera Editing in a Miniseries/Special for 1995. ↑ "Amelia Earhart." YourTrailers.net. Retrieved: May 2, 2012. ↑ "Amelia Earhart: The Final Flight (1994) Full credits." imdb. Retrieved: May 3, 2012. ↑ Hiltbrand, David/ "Picks and Pans Review: Amelia Earhart: the Final Flight." People, Vol. 41, No. 22, June 13, 1994. Retrieved: May 3, 2012. ↑ "Amelia Earhart (1976): Miscellaneous Notes." Turner Classic Movies. Retrieved: May 3, 2012. ↑ Mikkelson, David and Barbara. "The Plane Truth." snopes.com, 2012. Retrieved: May 3, 2012. ↑ Germain, Scott. "Fighter Rebuilders." warbirdaeropress.com, 2006. Retrieved: May 4, 2012. ↑ "President." planesoffame.org. Retrieved: May 4, 2012. ↑ "About Susan Clark." yahoo.com. Retrieved: May 3, 2012. ↑ King, Susan. "Amelia Earhart's soaring spirit." Los Angeles Times, May 25, 2009. Retrieved: May 3, 2012. ↑ Butler 1989, p. 416. ↑ Lovell 2009, p. 351. ↑ Goldstein and Dillon 1997, pp. 273–274. ↑ Kennedy, David M. "She was betrayed by fame." The New York Times, November 26, 1989. Retrieved: May 2, 2012. ↑ Tucker, Ken. "TV Review: Amelia Earhart: The Final Flight (1994)." Entertainment Weekly, June 10, 1994. Retrieved: May 3, 2012. ↑ Phillips, Joseph. 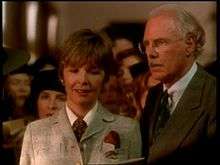 "Amelia Earhart - The Final Flight (1994) Diane Keaton." ' 'Rare TV on DVD. Retrieved: May 3, 2012. ↑ McCallion, Bernadette. "Amelia Earhart: The Final Flight: Overview." msn.com. Retrieved: May 3, 2012. ↑ "Awards for Amelia Earhart: The Final Flight (1994)." Turner Classic Movies. Retrieved: May 4, 2012. ↑ "Amelia Earhart: The Final Flight (1994) Awards." imdb. Retrieved: May 4, 2012. Goldstein, Donald M. and Katherine V. Dillon. Amelia: The Centennial Biography of an Aviation Pioneer. Washington, D.C.: Brassey's, 2009, first edition 1997. ISBN 1-57488-134-5. Lovell, Mary S. The Sound of Wings: The Life of Amelia Earhart. New York: St. Martin's Press, 1989. ISBN 0-312-03431-8.